The evidence continues to mount that the US is entering into a recessionary environment. Really, it’s old news however it’s also unsupported by official data. It’s a slow descent into a recession, because we know that the “data” will not be displayed to show the recession in real time. It will be ex post facto revisions from the BEA that finally let the cat out of the bag, so to speak, sometime next year by my estimation. When it comes to markets and macro-data, people often assume that a forecast of possible events means the event is absolutely imminent. We are moving into a recessionary environment in total and even if this is yet to be supported by official government data sources, the real-world business data is painting a fairly clear picture. Caterpillar has been tanking for how many quarters now? Fastenal, a leading industrial supplier with close to $4B in revenues, recently had the pleasure of having its newly promoted CEO, Daniel Florness, exclaim to the investing world just exactly what kind of economic environment the company is currently operating in. Want a larger business as proof? Take Grainger’s guidance then. Grainger is in a similar business however they do almost 3 times as much revenue and own a larger share of the MRO (maintenance, repair, operations) supplier market. Additionally, a full third of Grainger’s business is earned via government, retail, and commercial businesses versus just manufacturing and other industrial segments. Opposing opinions will point to the 2 very obvious elephants weighing down US economic results, which are the continued rout in petroleum energy and the strength in the US dollar. The fact of the matter is that petroleum-based energy sources are not the only commodities sold and moved through the US. Self-evident? Sure energy companies have taken a major hit, but look what cheap oil and gas has done for everybody that uses the product. Wasn’t the savings from cheap gasoline supposed to drive retail sales? Are airlines not actually producing record profits on the back of cheap jet fuel? Let’s take a look at the AAR monthly rail traffic report through most of the 3rd quarter. 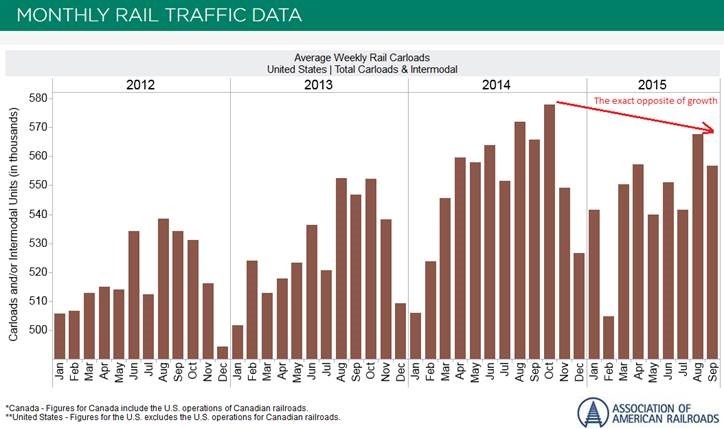 Observe how carload and intermodal traffic are beginning to tip over. For the sake of unfamiliar readers, carloads are what commodities such as coal, grain, etc. are transported in. Intermodal is utilized for consumer goods like appliances, TV, clothes, and all the other goodies that credit cards get maxed out for. If you visit the AAR site and just drill down on carloads, the data is significantly more alarming. The funny thing about commodities is that they’re the input that the manufacturers consume in order to create an output the end-users consume. Reduced end-user consumption, reduced commodity consumption. Basic economics, right? The drop-off in traffic for carloads only is vast. Intermodal continues to grow but how much of that traffic can be attributed to excess inventory buildup for a holiday sales party that may never materialize? Come on Black Friday don’t fail us now! 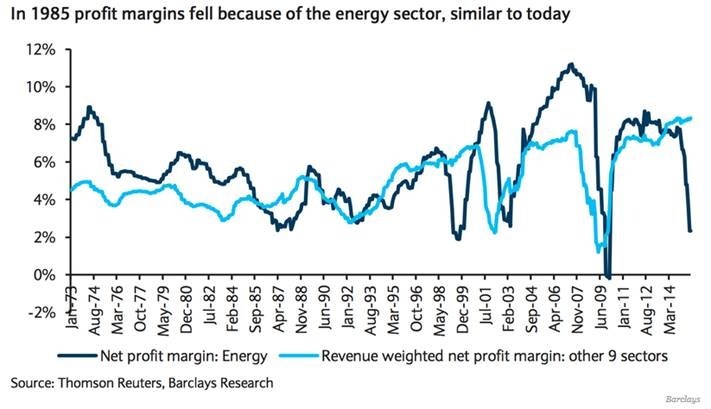 I know how important energy is to total market earnings and how petroleum has skewed the data downward. That data is readily available for all to see the impact. However, the rail traffic, commodity prices, wholesaler and retail sales are supposed to simply take a backseat to oil and the dollar when it comes to analysis of the US economy? Wal-Mart rocked the entire stock market single-handedly when it guided that 2016 profits would drop by as much as 12% next year as the behemoth spends heavily to increase wages, improve the store experience, and build out and expand its online presence, all while dropping a cool $20B over the next couple years in share buybacks…which is not to support earnings of course. Managing earnings would be unethical. Putting salt on the wound, management also shared that they expected sales to be flat as opposed to previous estimates of 1% to 2% sales growth. Let’s find a bright spot somewhere. Do a dance around your sombrero for Mickey D’s reporting positive comps in sales, finally, of less than 1% but I’d still be a whole lot more worried about what Wal-Mart’s performance in Q4 could mean from a macro standpoint. All the information examined so far is widely reported, but let’s take a closer look at a less orthodox indicator. The hospitality industry, specifically hotels, reports all sorts of proprietary business information. One of the leading aggregators of this data is STR Global. They produce reports that can be drilled down to specific markets and segments. Hotel properties can report to STR that they have decreased their supply of rooms. This will of course positively affect a property’s STR revenue-based metrics. How is this done? Simply. Let’s say a hotel has 500 rooms on the property. Business may be exceptionally slow and cannot support current labor levels. So the GM simply puts 250 rooms out of service indefinitely. Now when data is uploaded to STR, room supply is halved but ADR and RevPAR at the very least maintain but more probably improve due to a lower bar being set for occupancy based room supply. Where does this begin to affect the greater economy? In the suppliers to the hospitality industry. Less rooms in use means less cleaning supplies needed, less turnover in linens & terry, FF&E investment diminishes and so on. But what’s worse is that suppliers, whether they are manufacturers or wholesale suppliers may create or modify business operations based on STR market data. Revenue goals at suppliers may be maintained at artificial levels despite decreasing occupancy levels in various hospitality markets. There are continued knock-on effects to be rationalized. I leave those effects to readers’ imaginations. Do you think this is not happening, that rooms are simply identified as “out of service” so that results can be manipulated? I assure you this is happening. Room supply is one of those very important pieces of information that gets completely overlooked as long as ADR and RevPAR are steady or increasing. It’s absurd. You’d think sharp, experienced minds would see through this kind of thing but it is regularly glossed over, much like budget timing cycles in evaluating an underperforming sales person who may simply be having a tough time attaining goals due to the timing cycle after coming off of a monster year, as opposed to an actual lack of effort or skill. I have multiple, highly reliable sources that have assured me of this practice but it’s not like it’s a secret or some sort of industry cover-up. It will be openly talked about if addressed by the appropriate parties. None the less, this behavior of massaging hospitality data can be misleading in one of the US’s leading service-based industries. The travel and tourism industry in the United States generated nearly $1.5 trillion in economic output in 2013. This activity supported 7.8 million U.S. jobs, and accounted for more than 9 percent of all U.S. exports. One out of every 18 Americans is employed, either directly or indirectly, in a travel or tourism-related industry. In 2014, U.S. travel and tourism output represented 2.6 percent of gross domestic product. Hospitality matters and data integrity across all industries and entities is critical in making accurate business and economic assessments. But let’s come back to the larger markets. I would venture that there are only a handful of quarters left at best where debt issuance will be seen as “cheap and easy” in order for companies to fund share buybacks. Once that jig is up, then actual sales, profits, and responsible allocation of free cash flow will have to continue to push that game forward. You willing to continue betting your hard earned cash on the responsibility of corporate CEOs in a world already overflowing with debt? The question, as always, is how is all this actionable? And the answer is that inaction is the action. Continue raising cash. I’ve been sharing that same tired message for a little over 18 months and I’ll continue to reiterate it. I’m still highly allocated to the equity markets. I continue to actively trade albeit much, much more selectively now. The strategy is not go to all-cash, it’s raise cash. There is little doubt in my mind that cash-poise will be rewarded with asset-prosperity. Coming back to what all this data talk is focused on, the BEA releases the advance estimate for GDP tomorrow morning at 8:30am EDT. Let’s see if a convergence begins with the real world compared to official-statistics world. The 3.9% revision in Q2 from the negative Q1 was eye-opening. I’d say get ready for some volatility tomorrow either way the estimate reads.